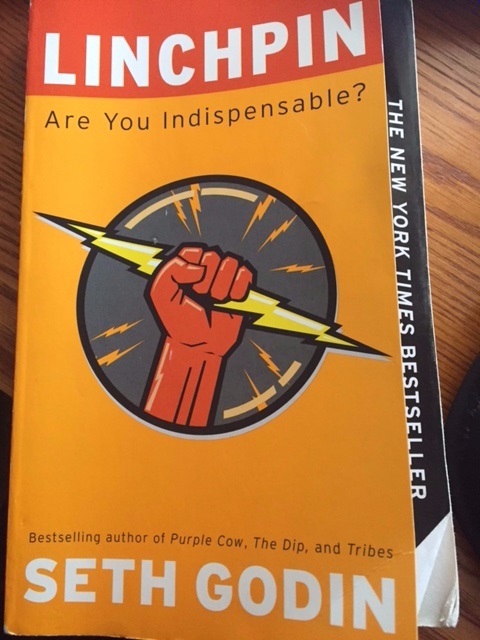 "Linchpin: Are You Indispensable?" may be looked upon as a companion book to "The War Of Art" by author Steven Pressfield [See blog, The Book, Part I] because it devotes an entire chapter to Resistance or, as its author Seth Godin describes it, "the lizard brain" ... it's a book about you, your choices, your future, and your potential to make a huge difference in whatever field you might happen to choose. Godin explains that there used to be 2 teams in every workplace: management and labor. Now there's a 3rd team: the linchpins. These people figure out what to do when there's no rule book. They don't think outside the box ... because outside the box there's nothing but a vacuum ... there's no rules ... no reality ... nothing to interact with ... nothing to work against [See blog, Thinking]. Godin maintains that if we set out to do something way outside the box we'll never be able to do a real work of art. He claims (rightfully so, in this organist's opinion) that artists think along the edges of the box because that's where things get done ... that's where the audience is ... that's where the means of production are available ... that's where they can make an impact. This is described on this web site in another blog/archive posting [See blog, Thinking Outside The Box], but it's so fundamental and important to understand that it's being reiterated here. Linchpins delight and challenge their customers and peers. They love their work, pour their best selves into it, and turn each day into a kind of art. They're the essential building blocks of great organizations. They may not be famous, but they're indispensable. And, in today's world, they get the best jobs and the most freedom. Every day we meet people who have so much to give, so much to contribute, but have been bullied enough or frightened enough to hold it back. Godin reminds people in this book that it's time to stop complying with the system and for people draw their own map, that they have brilliance in them, that their contribution is essential and the art they create is precious. When we feel the jitters every time we contemplate doing something new and creative that will lift us to a higher level of spiritual, educational, ethical, or physical attainment, the lizard brain (resistance) is what's responsible for our fear. This is the voice that tries to talk us out of it. This is what tries to sabotage our success. And unless we know about it, we don't realize that it's holding us back [See blog, The Lizard Brain, Parts I-VII]. People don't always realize that they've got a gift to give to the world; all they seem to know is fear. Art is a gift, a personal act of courage, something that one human being does that makes a collision with and creates change in another human being or group of people [See blog, When We Have Art]. Anyone who really wants to get somewhere with their organ playing and composing would do well to consider reading these 2 books (The War Of Art, and Linchpin) and putting into practice what they have to say.